Mojito is basically a alchohol based drink that has mint leaves, lemon juice (citrus flavors) and sugar. A mojito that does not have alchohol in it is a ‘virgin mojito’ and is categorized as a mocktail. So, what is a mocktail? Mocktail is a non alchoholic drink which consists of a mixture of fruit juices, syrups or soft drinks. Mocktails like fruit punches can be consumed by all those who relish flavorful drinks without alcohol. Preparation of virgin mojito involves adding lime juice, sugar syrup and mint leaves in a serving glass. With the helps of a muddler or spoon this mixture is gently crushed to lightly bruise the mint leaves so that the essential oils are released. Chilled aerated drink like spirte is slowly poured into the glass and stirred to mix. 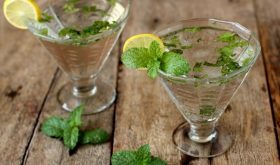 This mocktail drink can be garnished with a lemon slice and few mint leaves. Add some ice cubes and you are ready to beat the heat with a glass of refreshing virgin mojito. Prepare sugar syrup by heating 1 1/2 tbsps of sugar in 1/4 cup water on low to medium flame. Let the sugar dissolve completely. Allow to simmer for a little less than half a mt. Turn off flame and bring the sugar syrup to room temperature. 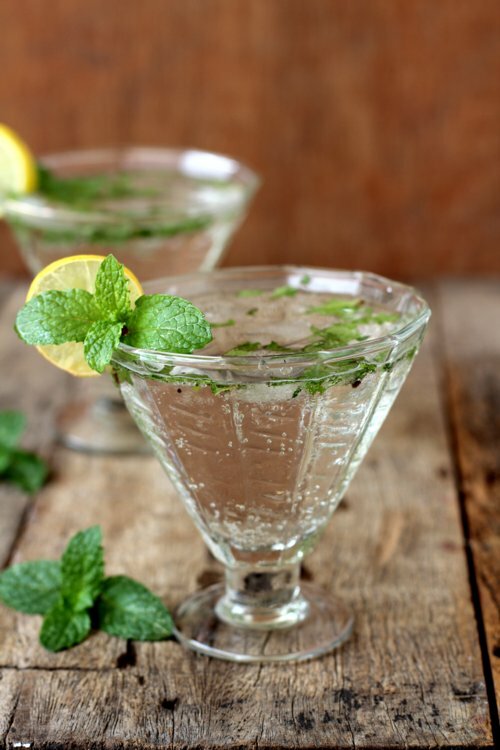 Take a serving glass, add 7-8 fresh mint leaves, a tbsp of sugar syrup and a little more than a tbsp of lemon juice. Use a muddler or a spoon to gently crush or bruise the mint leaves. Slowly pour the chilled sprite into the glass till it almost reaches the brim and stir to mix. The above recipe makes 3 glasses. Follow the same procedure (Step 2 & 3) to make 2 more glasses of the mocktail. 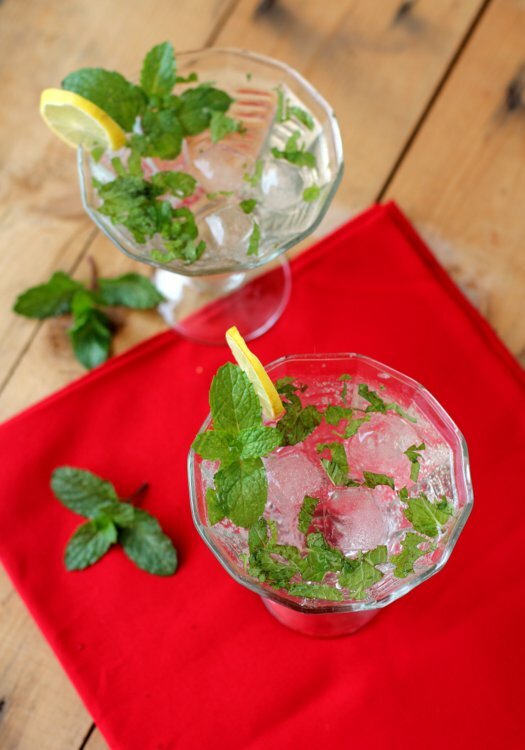 Garnish with a slice of lemon, a small sprig of mint leaves and add 2 to 3 ice cubes in each glass. Serve. Instead of sugar syrup, you can add a tsp of sugar in each glass. You can use club soda, 7 Up, Mountain Dew or ginger ale instead of sprite. You can make a large pitcher of virgin mojito and add cucumber slices to it. By Sailu Published: April 6, 2015 Recipe of virgin mojito mocktail.Learn how to make mocktail with sprite, mint, sugar, lemon.Simple mocktail recipes to beat the heat or to serve at a party. nice recpe but what about the ingrident brown sugar ??? ?